If you are noticing rough, flaky skin on your eyelids you may be asking yourself, why are my eyelids dry? 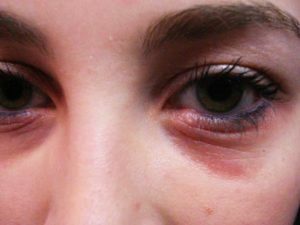 Other symptoms may include eyelid redness, itchiness, or an uncharacteristic irritation that does not seem to go away. Since the skin on your eyelid is much thinner than other parts of your body and there are a lot of blood vessels that surround it, you may notice common skin conditions on your eyelids before you notice them on other parts of your body. There are a few common causes that contribute to dry eyelids including climate, hot water, signs of aging, and lack of humidity. If you reside in a cold or dry climate, even during only certain parts of the year, your eyelids can be affected. Cold and dry climates can cause exposed skin to not retain enough moisture and even make the skin crack or bleed. Washing your face on a regular basis with hot water can also cause your eyelids to appear dry. Try turning down the heat when you are washing your face or taking a shower, so your skin can retain more moisture and not get irritated as easily. If you are 40 or older, chances are you are already using anti-aging moisturizers. The skin on your eyelids is affected from the aging process. Our skin naturally thins with age. Applying a daily moisturizer can help our skin retain moisture and even rebuild cells that are starting to decrease as we age. A lack of humidity in the air can also cause dry eyelids. Environmental factors play a part when we expose our skin outdoors in the winter or to an area with dry heat. However, indoors can be a problem too. If your home is not properly humidified, your skin can become dry. You can also suffer from this issue if you work in an office that has low humidity. If the above factors do not pertain to you or your symptoms persist beyond over the counter products, you may have a more serious condition. 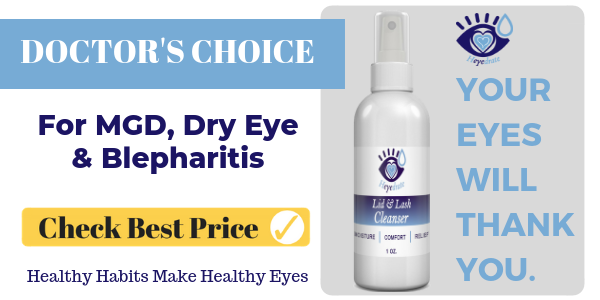 Dry eyelids can result in the diagnosis of dermatitis or blepharitis. 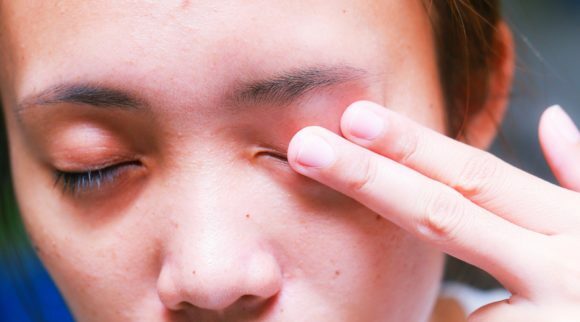 Contact dermatitis is diagnosed when a substance that comes in contact with your eyelids causes an irritation. Common irritants include cleaning and styling products for your hair, face washes, and makeup, as well as moisturizers, sunscreen, chlorine, dust, dander and more. Always try to use natural products that have as few irritants as possible. Fragrances, parabens, and metals can all cause sudden onset contact dermatitis. 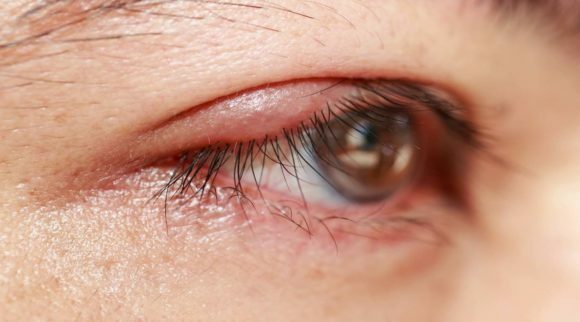 Contact dermatitis can also easily spread to your eye if the irritant is on your hands and you rub your eyes. Atopic dermatitis is more serious and should be diagnosed by a doctor. Instead of contact irritants, atopic dermatitis is caused by genetics, environment (where you live and work), or your own immune system. If you are diagnosed with atopic dermatitis, you will have the condition for life, but certain medications and creams can help you manage outbreaks. Sometimes changing your diet, lifestyle or even where you live can be beneficial in treating atopic dermatitis. Blepharitis is characterized by flakes and scales on the eyelid. It is a condition caused by bacteria or a side effect of the reddening of the skin (Rosacea). Blepharitis can also be caused by an imbalance in hormones or allergies. 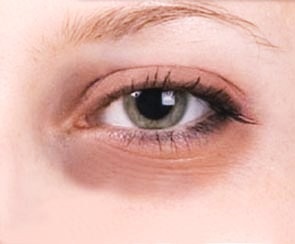 It generally occurs along the lash line and the inner edge of the eye. You may also notice eyelid redness, burning, tearing, blurry vision, sensitivity to light, and scaling of the skin. If left untreated, it could cause damage to your eyes or eyelids. 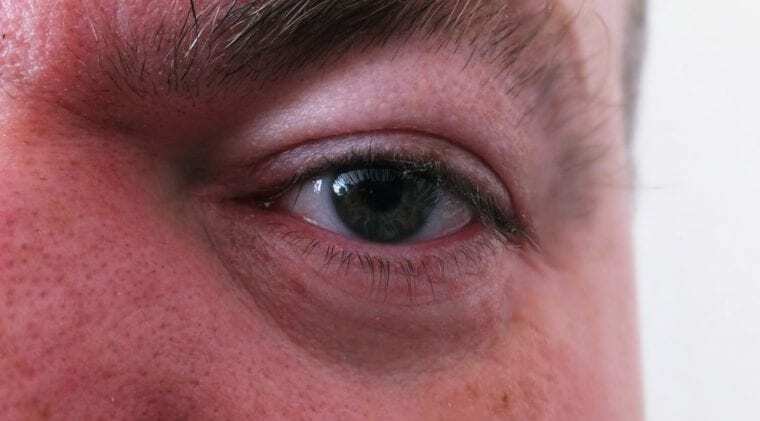 If you think you may have dermatitis or blepharitis, it is recommended to schedule an appointment with an eye doctor or dermatologist so they can properly diagnose you and plan treatment to alleviate your symptoms right away. 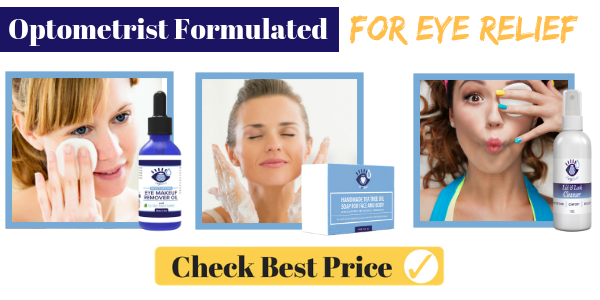 Stop asking yourself why your eyelids are dry and look into some of our favorite products below for treating dry eyelids. Whether you choose a cream, moisturizer or lotion, adding hydration is key in treating dry, itchy, red eyelids. In 2014, Josh Meyer & Matt Bolduc founded Brickell, a skincare and grooming company for men. Their passion for the brand came after trying unsuccessfully for months to find the best and most natural products on the market. The brand may have had humble beginnings in Matt’s garage, but it is now selling in over 20 countries. Brickell has been featured in GQ, Men’s Health, and Men’s Journal to name a few. 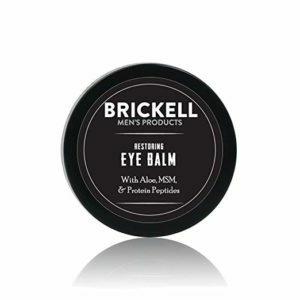 Brickell Men’s Restoring Eye Cream helps tighten skin and get rid of dark circles. The cream strengthens the skin around the eyes, helping to reduce puffiness and unsightly bags. The cream absorbs super-fast so you can get on with your day. Feels moisturizing on the skin and does not leave a greasy or excess shine in appearance. When used twice daily as directed, the cream will last approximately a month and a half. The cream is all natural and contains organic ingredients. Brickell eye cream is unscented and can be used by people with sensitive skin. All Brickell’s products contain zero sulfates, parabens, glycols, phthalates, petrochemicals, silicones, PEG’s, sulfates, synthetic fragrances, or gluten. This cream is also vegan friendly and is cruelty free (no animal testing). How to use: A little goes a long way. Use a pea sized amount and apply gently underneath eyes. For best results, use once in the morning and once at night. 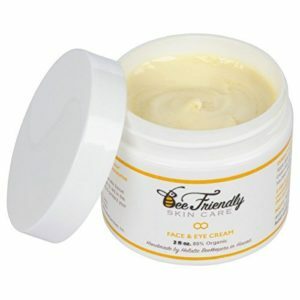 BeeFriendly Face and Eye Cream is all natural and certified organic. The cream has been clinically proven to reduce the appearance of fine lines and wrinkles and deeply penetrate the skin to increase moisture and elasticity. The cream is handmade in the USA. The product contains no chemicals, no fillers, no SLS (Sodium Lauryl Sulphate), no parabens, no fragrances, non-GMO, gluten free and cruelty free. It is great for rejuvenating eyelids, face, neck, hands, anywhere you need to soften the skin. Perfect for all ages. Raw honey acts as a barrier against toxins, stimulates collagen, and skin cell regeneration. Beeswax helps keep your skin youthful. Propolis helps your skin heal. Bee pollen provides nutrients to the skin. Organic olive oil has vitamin A and vitamin E to mimic the fatty acids found in your skin. Since there are no fillers, the product is highly concentrated. A little really does go a long way. Ingredients: USDA CERTIFIED ORGANIC – Purified Water, Organic Extra Virgin Olive Oil, Organic Beeswax (contains Pollen & Propolis), Organic Raw Honey, Organic Vitamin E, Organic Bergamot Essential Oil (bergapten free), Organic Amyris Sandalwood Essential Oil. How to use: BeeFriendly Face and Eye Cream is safe to use daily. Use the product after cleansing your skin. Use a circular motion to rub in the cream until it has absorbed. Applying too much of the cream may take it longer to absorb into the skin. Since there are no chemicals, the product ingredients may separate. If this happens, know that you have a high-quality ingredient product and simply stir the contents before applying for best results. 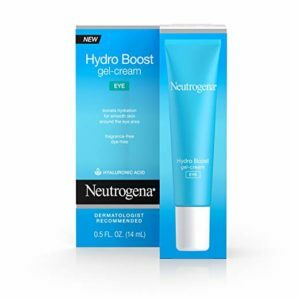 If you’re looking for a solution for dry eyelids, Neutrogena Hydro Boost absorbs instantly and offers long-lasting hydration around the eye area. This product smooths skin and is wearable under regular makeup application. The gel eye cream is oil-free, fragrance-free, dye-free, and will not block pores. The gel eye cream has been tested by ophthalmologists and recommended by dermatologists. It contains purified hyaluronic acid, a natural part of your skin that naturally diminishes over time. It banishes dry skin and keeps your skin feeling hydrated all day long. L’Oréal Paris Age Perfect Eye Renewal Cream fights five signs of aging with one easy to use cream. If you’re wondering, “why are my eyelids dry?”, this cream can visibly reduce dark circles, decrease puffiness, reduce the look of under-eye bags, smooth wrinkles near the corners of your eyes, and help keep eyelids looking youthful. You will notice your eyes looking brighter and refreshed in hours after using the product for the first time. The age perfect formula helps reveal new cells on the skin’s surface. In four weeks, you will notice your eyes take on a more youthful appearance. The cream diminishes wrinkles, under-eye bags, and dark circles. How to use: Use in the morning and at night before bed for best results. Apply a small amount of the cream using clean fingertips on the entire area around your eyes. Pat the product until complete absorption is achieved. Notice the amount of ingredients in this product, so if it irritates your skin at all, don’t hesitate to discontinue the product. If you feel like your skin is aging and is not as hydrated as it used to be, L’Oreal Paris Age Perfect Hydra-Nutrition Eye Cream will help hydrate and tighten your skin. You will love the buttery soft cream that melts onto your skin. It helps reduce the look of dark circles, puffiness, and increases elasticity. The skin around your eyes is 10 times thinner than the skin on your face. Over time, the eye area can get extremely dry increasing the appearance of dark circles and under-eye bags. 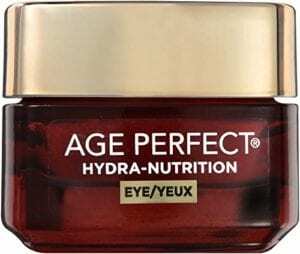 L’Oreal Paris Age Perfect Hydra-Nutrition Eye Cream contains four natural oils and calcium to provide a high-quality hydration and comfort. You will notice right away that the skin around the eyes feels firmer and looks smoother. For best results, use the product for at least one month. The cream is ophthalmologist and dermatologist tested. It is fragrance-free and is safe for everyday use. How to use: apply to the skin around the eye area in the morning and at night. Smooth the cream between your fingers and apply gently on the skin around your eyes. Product will absorb quickly on skin that has been cleansed. Once again, this product contains many ingredients and may not be suitable for those with sensitive eyes. 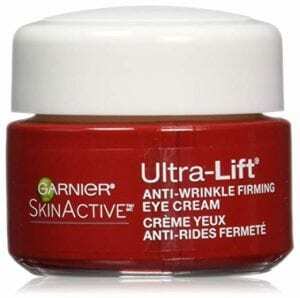 Garnier SkinActive cream is great for moisturizing dry skin and minimizing the look of wrinkles. The cream contains Pro-Retinol from nature (vitamin A), rice peptides, and caffeine to keep your eye area bright and youthful looking. The formula is dermatologist tested. It is gentle on skin, non-greasy, and will not clog your pores. How to use: For best results, apply after using an Ultra Lift Moisturizer. Use in the morning and at night by gently placing the cream around the eye area including eyelids. If irritation occurs, stop using product immediately. This eye cream is great for both men and women that are concerned about aging skin and wondering why are my eyelids dry. The moisturizer contains Vitamin C, Rosehip Seed Oil, Vitamin E, and Organic Hibiscus Flower Extract for the ultimate hydration and skin repair. 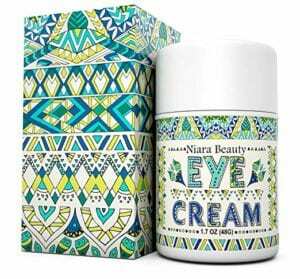 Niara Beauty eye cream is made in the USA and contains no fillers, harmful fragrances, dyes, or parabens. It is manufactured in a GMP Certified and FDA Registered Facility. It is not tested on animals. The moisturizer is also gluten free and vegan friendly. Not only does it help hydrate and provides you with younger looking skin, but it also decreases age spots and hyperpigmentation. Five percent of the sales of Niara Beauty products go to help women and children in impoverished countries with a concentration in education. How to use: Use once in the morning and once at night for best results. Place small dots of the cream under the eye and on the upper eye lid. Gently pat the cream into the skin. Allow it to absorb in to the skin before applying your regular makeup. Safe to be used on other parts of the face. 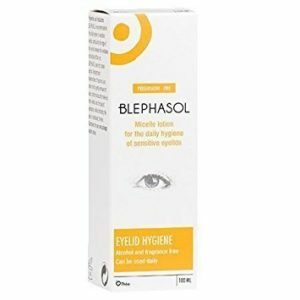 Blephasol lotion was created to treat blepharitis and is gentle enough to use daily on your eyelids. There is no need to prep your eyelids before use, and you do not have to rinse your eyes after use. It works best when used once in the morning and once in the evening but can also be used as needed. Blephasol is fragrance-free and does not contain alcohol, preservatives, or detergents. 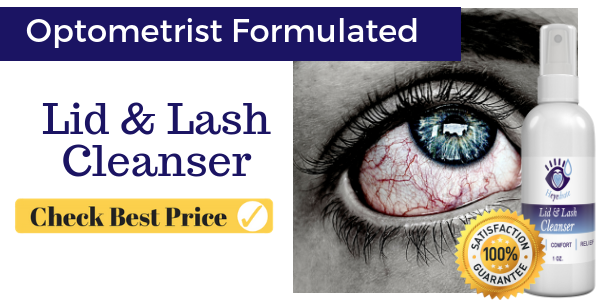 The formula is great for contact lens wearers. Ingredients: Aqua, PEG-8, Polysorbate 20, Capryloyl glycine, Poloxamer 184, PEG-6 Caprylic/Capric Glycerides, Dipotassium Phosphate, Sodium Hydroxide, Potassium phosphate. How to use: use lotion as directed by product packaging. If you are suffering while trying to find a solution for your dry eyelids, there are treatments available. You can also modify your diet or lifestyle to help hydrate your skin better. If you live in a cold climate in the winter, consider adding a humidifier to your bedroom or install a whole house humidifier. The extra moisture will mimic warmer months and help your skin gain some of the moisture it naturally loses in a cold or dry environment. Use makeup, face washes, and moisturizers that are fragrance free. Since fragrances are not regulated, you do not always know what is in the fragrance that causes you to have an adverse reaction. Fragrance-free products you place on your eyelids are safer to use every day since you do not have to worry about placing harsh chemicals on your delicate skin. If you frequently suffer from dry eyelids, use a cold cloth or eye mask to soothe the irritation, redness and itchiness. The cold cloth can also help with any swelling or fatigue you may experience in your eye area. However, if you suspect you have or have been diagnosed with blepharitis, it is better to apply a warm cloth to your eyelids to soothe irritating symptoms. Hot water is a big factor in drying out your skin, especially if you are over 40. Anytime you wash your face or take a shower it is important not to turn up the heat too much. The more heat that is applied to the skin, the more it will rob the skin of moisture. Once the skin has lost moisture, the only way to revive the skin is by applying a moisturizer or cream. 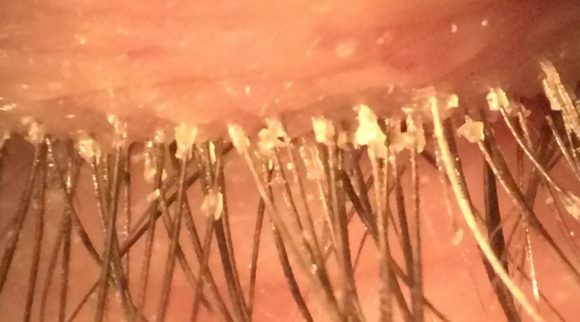 While this works, it can be costly and applying unnecessary chemicals to the delicate eyelid can add up over time and cause additional problems. Try to avoid touching your eyes or your eyelids. 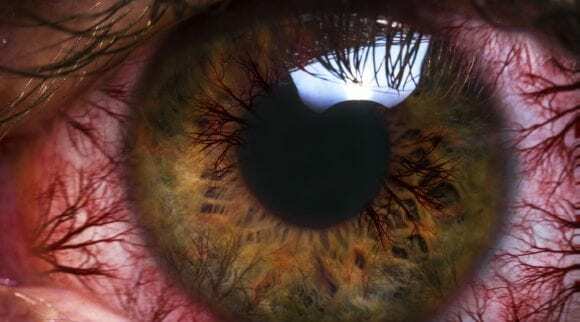 Bacteria from your fingers can easily spread to the eye and the skin around your eyes. If you must rub or touch your eye area, always wash your hands first to make sure they are clean. If you wear makeup, especially eye makeup, make sure you are taking all of your makeup off before you go to bed at night. Makeup can get into your eyes or irritate your eyes while you sleep. The makeup can also get on your pillow or sheets where bacteria can grow. Anything that comes in regular contact with your eyes should be cleaned and disinfected regularly. If dust and dander are a common problem for your eye area, consider wearing protective eyewear to reduce the irritants that reach your eyes. If you wear contacts, you should make sure they are cleaned before they are placed in your eye and then cleaned again before you place them in a clean container with fresh solution. Avoid sleeping in your contacts or wearing them for extending periods of time. When you first notice dry skin on your eyelids, if that is your only symptom, it is not usually a cause for concern. Some people, especially those over 40, will notice they have dry eyelids. For most, adding a moisturizer to their daily routine can help curb the loss in hydration and get your eyelids looking healthy again. However, eyelids that are flaky and irritated can be very uncomfortable and unattractive. If you are dealing with these symptoms, you will need to use a cream or an enhanced hygiene routine to control the flare-ups. If you have tried treating your eyelids and the condition is persisting or getting worse, you should contact your doctor. 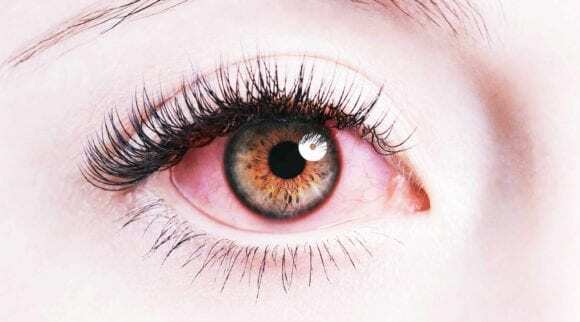 A visit to your doctor will put your mind at ease, get a proper diagnosis, and will generally give you a stronger over-the-counter or prescription cream that will give you some relief from your dry, red eyelids. You should also tell your doctor about any other symptoms you are having since dry eyelids can also be the cause of larger health issues. Dermatitis can be as easy to treat as applying a cream or finding the cause of the irritant. Your doctor can determine if you have contact or atopic dermatitis to provide you with a proper diagnosis and treatment. Blepharitis treatment is a little more complicated and may require a few steps on your part to get your eyelids back to a comfortable state. You may be asked to gently remove the crusts from your eyelids on regular basis, use a gentle cleanser to keep the eyelids clean, and also apply a topical cream to keep the skin hydrated and protected. It is important to keep an eye on your dry eyelids. If the condition persists, try using one of the treatment creams we recommend above. If your dry eyes persist after using a cream or similar treatment, you will need to make an appointment with a doctor. If you are experiencing daily discomfort or have additional symptoms, do not wait to make an appointment to find out why are my eyelids dry. Not taking the time to treat your eyelids will eventually cause damage to your eyelids or even eyes.